Welcoming you to Oak Cove Resort! Lake Cora is very lovely to swim, raft, snorkel, fish, and look at while you hang out on the resort's private lake frontage. Kayak, Rowboat, Paddle-boat, and Paddle-board use is free of charge and on a first come, first served basis. In addition to our wonderful outdoor amenities we also serve Breakfast and Dinner which is included in the price of your stay. Kayaks waiting for the next opportunity to slip into the lake. My family of 20 had a wonderful time. With 10 children ages 9 and under, they were easily entertained for most of the time with the great food, sandy beach, boats, fishing, fun house, heated pool, recreational outdoor games, and swing sets. Free Wifi also helped with getting the kids to relax after waking up and before bed. This place has excellent service, wonderful food, and entertainment for children. The owners (Bob and Susan) and staff are all kind and sweet. It felt like home and all accommodations were included in the price. Oak Cove is quiet and peaceful. We really enjoyed our stay and hope to come back soon. This place is truly a Jen! Bob and his wife are the sweetest couple (owners). Beautiful setting on a hill around the lake. With larger cabins available. Access to bikes, paddle boats, etc... Their breakfast is very delicious . Consists of fresh fruit, yogurt, biscuits and gravy, scrambled eggs, muffins... and the staff there are super friendly. There is also a fenced in pool to relax at as well.Definitely recommend staying here! This place was amazing!!! The staff is absolutely wonderful. The old time atmosphere in the dinning room was so interesting to see. The food was outstanding and all made from scratch. You get breakfast and dinner with your stay. We really did not need to bring much extra food because they feed you well! Great place for a couple, family or even a large group. They can accommodate any size. Lots to do while you are there. (Fish, got swimming in the pool or lake, take a canoe, boat or paddle boat on the lake, game room with pinball machines, outside games such as ladder golf, corn hole, baseball, tether ball and to boot free golf on a beautiful golf course every day!) A must go and experience this and you will be hooked! Friendly atmosphere! Great food and great people! Great place for our family. We have a 4 2 and 1 year old, and this was ideal for us. We rented a house with plenty of room, we had extra guests throughout that Bob and Susan accommodated without problem. The food was great and we prepared lunch in our kitchen. We really didn't need to leave the property. We just swam in the warm pool, warm lake, played with the games, rented a pontoon one afternoon, fishing was great. Start your kid’s summer off great, just ask about special rates for children available the first two weeks of June. Just a stone’s throw from South Haven! Located on 16 wooded acres overlooking beautiful, sparkling clear 300 acre Lake Cora, Oak Cove Resort in Southwest Michigan has remained a fantastic and relaxing vacation destination for individuals, couples and families alike. Included in our low rates are historic lodge rooms, cottages, and houses; complete breakfasts and sumptuous dinners every day, many including the fresh fruits and vegetables grown locally. You will have unlimited use of rowboats, canoes, paddle boats and kayaks, a heated in-ground pool, volleyball, badminton, shuffleboard, horseshoes, paddle boards, bicycles, and nature trails. Free Golf every day! Plentiful area attractions include some great antiquing, an absolutely huge weekend flea market nearby, great area shopping, Paw Paw wineries tasting and tours, U-Pick fruit farms, go-karts, area power boat and jet ski rentals, miniature golf, and much more. For a day trip, beautiful Lake Michigan beaches are 35 minutes away. 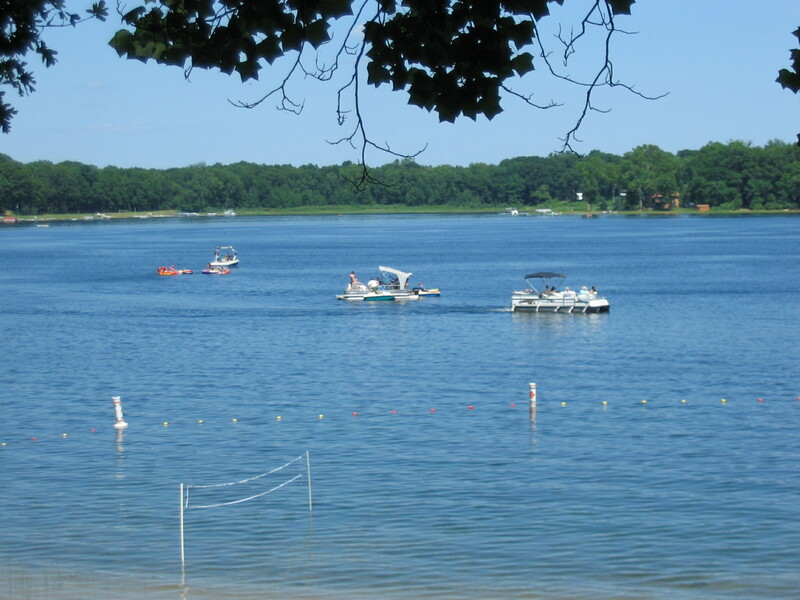 Oak Cove Resort is open during the Michigan summer season, from early June through Labor Day. Although most of our guests stay for the week, we do make arrangements for Bed & Breakfast weekends or other shorter duration stays as circumstances allow. We also specialize in family reunions and can accommodate up to 80 people at a time. Space for these types of gatherings does fill up quickly, so please inquire well in advance of your desired dates. There’s much more we would like to tell you, so please read on..
Our goal is to make your time restful and memorable. Go on over to the Accommodations and look inside!